The no-tools oil drain valve is easy to access when changing engine oil. The automatic transmission allows the operator to easily choose the desired forward or reverse travel speed by simply depressing a single foot pedal; this is similar to the way the driver of an automobile with automatic transmission changes speed when depressing the accelerator. 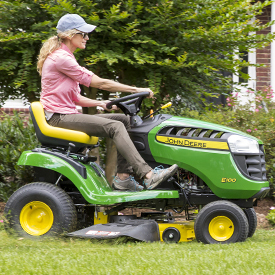 Whether a slow speed for trimming or faster speed for open-area mowing is desired, the operator can easily adjust by how far the foot pedal is depressed. 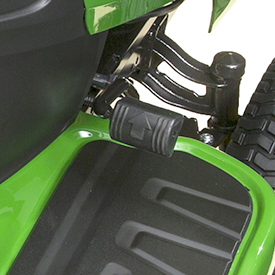 With the brake pedal depressed and the forward/reverse lever in the center position, the engine can be started. Once the engine is started, it is not necessary to use the brake pedal when selecting forward or reverse. Simply move the forward/reverse lever to select travel direction, and then press the automatic foot pedal to choose from an infinite number of travel speeds. 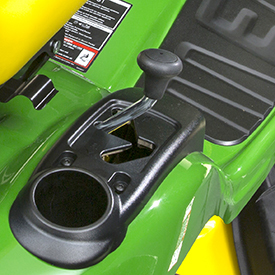 Controls are positioned where they are easy to reach and easy to use to control the tractor. 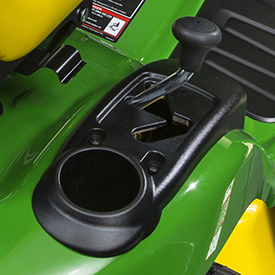 Steering wheel is positioned and angled to give the operator plenty of room and steering comfort. 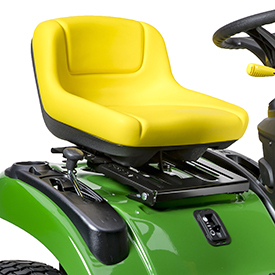 Seat is tilted back at the optimum angle to provide the most comfortable operator position. 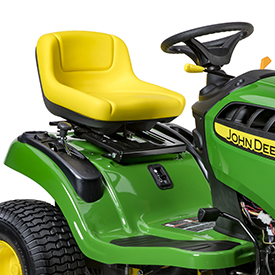 The operator seat has an 11-in. (27.9-cm) back height for good support. 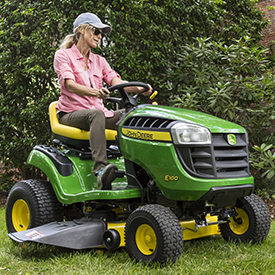 It can be easily adjusted forward or rearward while the operator is in the seat, with seat travel of 5.5 in. (14 cm) and 10 different positions. Increments of 0.25-in. (0.64-cm) allow for fine-tuning the cut height. 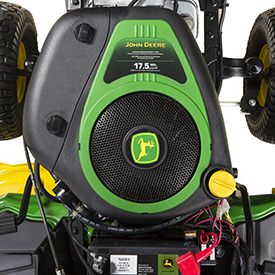 Cut height is adjustable from 1-in. (2.5 cm) to 4 in. (10.2 cm). 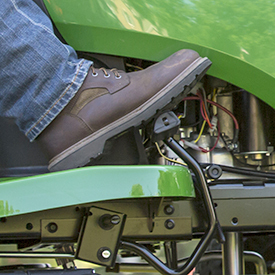 The parking brake control is conveniently located on the tractor pedestal for easy access. It holds the brake pedal securely in the locked position. 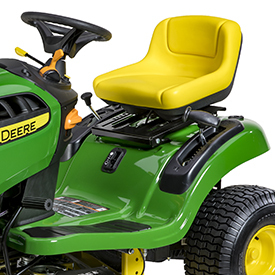 The mower deck is engaged with the easy-to-see and easy-to-use yellow lever above the dashboard. 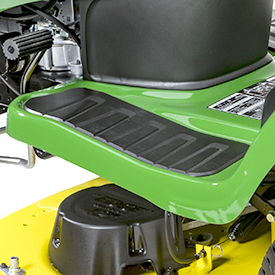 Its placement on the right side leaves a lot of room on the left, the entry side of the tractor, for the operator to get on and off the tractor.